If anybody got the most character development (complete with a backstory) from the villains -- it's Kirika. The story has a repentant Bouma named Devil Mask Bouma. He was found injured by a human woman (who's also played by Masako Morishita) and the two ended up getting married, hiding away from their kind and they bore a Nagare Bouma (in the mother's split image) in Kirika. This has me wondering why don't we get much of who Yamimaru's parents were and how he was even born. All that was known of Yamimaru is that he's a Nagare Bouma -- someone who's lived for thousands of years yet still has the mindset of a teenager with an attitude problem. The meeting with Kirika's father starts to melt her vengeance-crazed heart. She realizes that the Nagare Bouma are meant for both clans to co-exist. We saw some good monsters back then such as Ruffian Bouma, Sumo Bouma and Ice Bouma. Suzunari Bouma was only forced to fight because her tribe is under captivity -- which results to Jarmin's Moral Event Horizon in more than one level. This causes Kirika to later plead with Yamimaru to stop fighting. This was also triggered when her peace-loving father Devil Mask Bouma later got injured and killed in the process. She realizes her existence was meant to be peaceful and not to be the vengeance-crazed teenager she turned out to be! 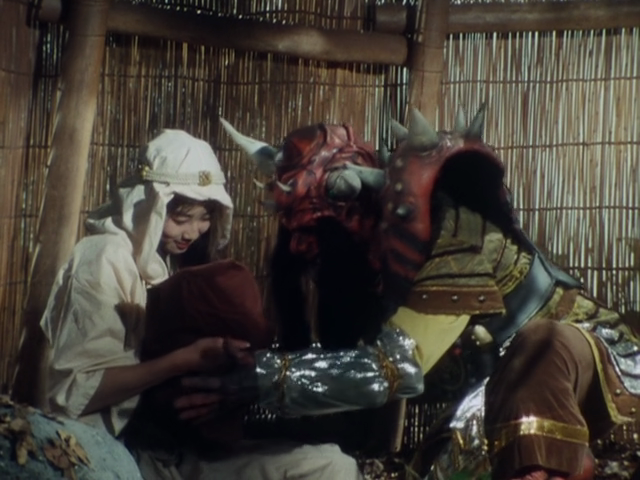 So how could Kirika be born thousands of years ago and still be 18 in Turboranger? All that was known was that she was raised by Skull Monsters and Amulet Bouma was her guardian. I was wondering how did time stop for them for thousands of years only for them to later escape? It's possible that the seals were slowly breaking -- it was just waiting for the main villains to be unsealed later on. Regardless, her guardians found themselves into the year 1971 (which 18 years later would be 1989) -- thus allowing an infant Kirika to grow up normally. What was also amazing was that she was a childhood friend of Shunsuke -- something she disdained because she wanted to be a full-pledged Bouma. She even took the risk of using Armor Bouma at the cost of her sanity and humanity -- resenting her half-human heritage. This also has me thinking about Hirohisa Soda also showing signs of burning out as he could have tied this plot with the first half. 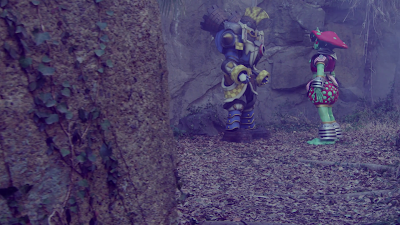 I remembered back in Turboranger episode 7 and I wish it was brought up even after Zimba was finally destroyed in episode 28. It could have been used to tie some loose ends about Zimba's backstory as a love-hating monster. Was Zimba really human before he became a Bouma or was he a Bouma who fell for a human princess? It seems to be that Zimba was once a peace-loving Bouma who fought for a princess he loved and was rejected simply because he was a Bouma. His Bouma heritage allowed him to live on the injuries and he swore to attack human love -- because he was rejected by a human princess! Devil Mask Bouma and Kirika's mother could have been a contrast to that one. The princess rejected Zimba for simply being ugly while Kirika's gentle mother saw through Devil Mask Bouma's kind heart. Loose ends, anyone? Kirika also proves herself to be the very necessary tool that redeems Yamimaru towards the finale. Yamimaru is still bitter and full of hate. Kirika tries to pull Yamimaru out of it. In fact, her redemption also pulls Yamimaru out of his hate and convinces him not to sacrifice himself to make up for his misdeeds. In the end, both Yamimaru and Kirika end up living peaceful lives as Hikaru and Sayoko. The thing with Kirika's age, I just assumed that the skull monsters kept her in a supernatural netherworld or a Bouma world or even the Makai, and she didn't start to age until they decided to raise her fully in the human world. Hi Shougo! Thanks for the comment! Your theory does make sense too. Well just expect me to respond to your finale posts anytime soon. 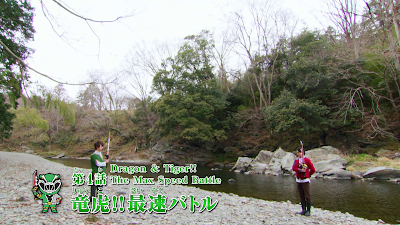 Be on a lookout for it while I write my episode reviews of Lupinranger vs. Patranger.